Something I have done in my spare time is teach drawing to local children (and a few adults). Often, it's the child who just isn't getting enough art in school and wants to do more. I stick to the basics, with emphasis on seeing and drawing correctly. Recently, one of my students wanted to understand color better and because she is young, I've tried to come up with a simple way to compare temperatures. I came up with this chart for mixing the colors and seeing what happens when warm and cool primaries mix. Much in the way Richard Schmid's color charts reveal the subtle differences in color mixtures, this helps show that two warm primaries don't necessarily make a vibrant secondary. You can use any combination of the three primaries, just make sure of the relative temperature comparisons. I print this out on an 11"x 14" sheet of watercolor paper, using my Epson R1900 so the ink doesn't bleed. We use watercolors. The student paints the outside circles the two primary colors we will be mixing. 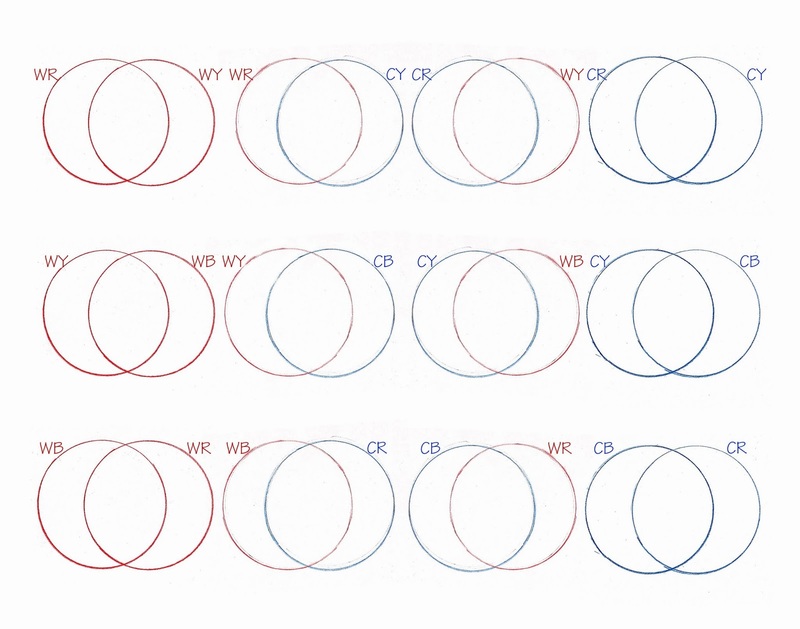 The centers of the overlapped circles are for the secondary mixtures. It's interesting to see how the secondary color in the center changes depending on the warm and cool primary choices. Please feel free to use this if you are interested. I would like to work with this as I don't always get the whole warm/cool colour thing though in some of my paintings I can see you the wrong emphasis makes the landscape almost unreadable. Thanks Stephen. If you paint landscapes, this exercise will be helpful. I was surprised to discover the combinations that created a more organic secondary that would look much more convincing in a landscape. The problem with temperature is that it's all relative to the color it's next to. That's a really good idea Kim. Thanks for sharing! This looks like a good tool. I teach, but I need to revisit things like this, for my own benefit, too. **I need review constantly, Angypants. This was a good reminder for me too. Thanks.